1. Occupational distribution of population is mainly influenced by __. 2. The reward for capital is __. 3. The reduction in the value of a country's currency in relation to the value of the currencies of other nations is known as __. 4. Mortgage banks give loans to investors on a long- term basis to __. 5. In a capitalist economy, factors of production are owned and controlled by the __. 6. The establishment of industries in rural areas will help to reduce __. 7. International trade is an application of the principle of __. 8. The number of people who are qualified to work and who offer themselves for employment is called __. 9. Which of the following is an advantage of localisation of industry? 10. The Economic Community of West African States (ECOWAS) has been slow in achieving its objectives because of __. 11. Joint ventures are partnership involving __. 12. In which of the following business units are the owners mostly the customers? 13. The formula is used to measure the __. Use the table below to answer question 14. 14. If specialisation should take place, then __. 15. Which of the following is an invisible item? 16. The full meaning of OPEC is __. D. Organisation of Petroleum Exporting Countries. 17. The main concern of economists is to __. D. allocate scarce resources to satisfy human wants. 18. Productive resources can also be called __. 20. The type of demand that exists between torchlight and battery is __. 21. The population density of a town made up of 50 square kilometre land area and 100 million people is __. Use the table below to answer question 22 and 23. 22. From the table, the mean of the distribution is __. 23. 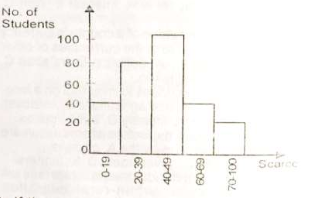 What is the median of the distribution? 24. Human wants are insatiable because wants are __. Use it to answer question 25 and 26. 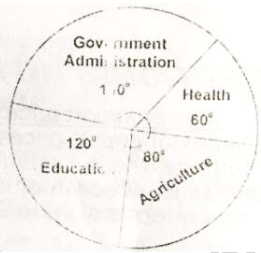 A country's budget allocation to various sectors of the economy is shown in the pie chart below. 26. What is the ratio of expenditure on health to Agriculture? 27. Which of the following items is not an example of circulating capital? 28. The principle of comparative cost advantage was propounded by __. 29. The rate at which a country's exports is exchanged for her imports is ___. D. balance of currency account. D. working conditions of workers. 31. 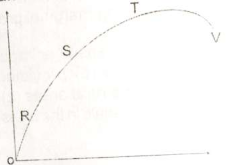 The diagram below represents a production function. At which of the points does diminishing returns set in? 32. Taxes and government expenditures are instruments of __. 33. A situation in which a commodity is sold abroad below its cost of production in the home country is known as __. 34. The Family Support Programme in Nigeria essentially focuses on __. 35. The Economic Commission for Africa was set up by the __. Use the histogram below to answer question 36 and 37. 36. If the pass mark was 40, how many students passed the examination? 37. How many students took the examination? 38. Utility is the satisfaction derived from __. 39. When a union is composed of workers with the same skill it is called ___. 40. The major objective, of a revenue allocation formula in a country is to __.